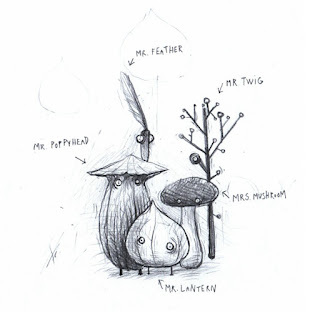 I first stepped into the world of Amanita Design when I played Machinarium at PAX '09. I was intrigued by the art design, the intricacy of the puzzles and the imaginative story it portrayed. Like something stolen from my childhood brain I wandered from scene to scene, becoming more ensconced by the world I found myself in. When I got word that Amanita's latest work, Botanicula, was debuting in a Humble Indie Bundle, I snapped it up at my first opportunity. Botanicula is something a little different from Machinarium. The setting -rather than a tin-toy, industrial steampunk world- is a rather idyllic tree. You play as a group of tiny critters trying to protect a seed from an evil, Cyclopean spider and his minions. This all makes total sense if you've seen/played anything from Amanita before. Throughout the game you are confronted with puzzles that play to a certain creatures talents. The trick becomes selecting the correct member of the group to solve each puzzle. Sometimes though, it's worth it to pick the wrong one as it often results in some of the funniest moments in the game. If at all possible, play Botanicula with family; as good a game as Botanicula is, it begs to be played with other people watching over your shoulder or taking turns at the puzzles. I played it with my oldest daughter and she spent the rest of the day drawing the characters and creatures we saw. The game became an interactive storybook, a choose your own adventure of puzzles and strange insects.We giggled and laughed at the bizarre events of the game, worked through puzzles and wandered the branches of the tree for a good two hours before we brought Botanicula to it's conclusion. Botanicula is adorable, inventive and entertaining. I highly recommend it to anyone with a taste for puzzle games. I think you'll find it to be an engaging and uplifting experience. If you're really smart and want a bigger sampling of Amanita Design's work, you'll grab your own copy of the Humble Botanicula Debut while it's still available. You'll get Botanicula along with Samorost 2, Machinarium, an awesome movie called Kooky, with art direction by the founder of Amanita Design, Jakub Dvorský and a ton of other little extras.